We use 10 - 10.5 mm diameter cane. The Ferrillo Machine is set to .60 mm in the center and .48 mm on the sides. 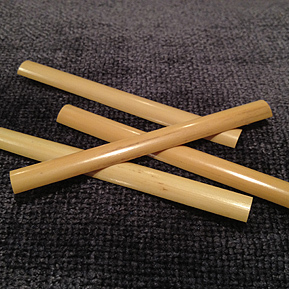 We find that it has a deep tone and big quality with finished reeds. We use 10 - 10.5 mm diameter cane. The Driscoll Opus 1 Machine is set to .60 mm in the center and .48 mm on the sides. We find the Driscoll Gouged Cane to have a sweet tone with a very beautiful color. It has a big sound yet is also great for chamber music. We use 11 - 12 mm diameter cane. The Graf Machine is set to .70 mm in the center and .58 mm on the sides.